Create your Dark Souls III character before you play with this online tool. If you've ever wished you could practice building a character in a Dark Souls game, this tool is for you. Basically, it lets you plan out every aspect of your character, from stats to equipment, so you're prepared before you have to do it in game. 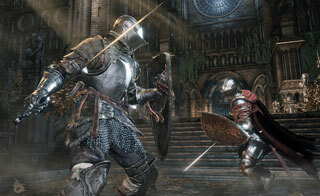 If you've been around the Dark Souls community for the past few years, you're probably familiar with this tool already. It was originally put together by a Dark Souls fan named nemesismonkey back in 2012, Since then, it has been taken over by Naiyt, who added in support for Dark Souls 2, Dark Souls 3, Demon Souls, and Bloodborne. Naiyt told Kotaku that, "There's an interesting subculture of Souls players who enjoying crafting builds as much or more than actually playing them in game. I've talked to a fair number of Dark Souls 1 character builders who say they rarely even play the game anymore, but still enjoy planning out characters." Apparently there are still over 150 characters created every day through the tool for the first Dark Souls. You can check out the tool yourself over at mugenmonkey.com.